I got some stepping stones the other day for a little over a dollar a piece. I wanted to "jazz" them up a bit. I've seen all these cute footprint pictures on Pinterest. 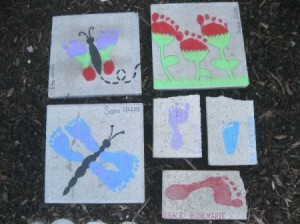 So, I put my kids' feet to work and made these little bugs and flowers, using patio paint (found in craft stores). The other 3 plain footprints are from last year. I love seeing how much they have grown. Make sure to follow the directions on the bottle. The paint needs to cure for 3 days before getting wet. You could also use patio paint to decorate your stones any way that you would like. Just let your inner artist come out!